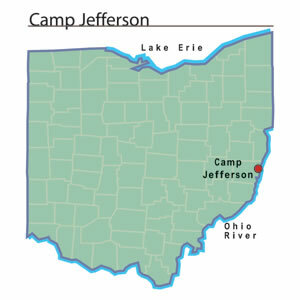 Camp Jefferson was located at Bellaire, Ohio. Governor William Dennison ordered the establishment of the post as a training camp for Ohio volunteers during the American Civil War. In April 1861, following President Abraham Lincoln's call for seventy-five thousand volunteers to end the Confederacy's rebellion, Governor Dennison encouraged Ohio communities to form and send militia units to the state capital at Columbus. The governor ordered the formation of additional camps, including Camp Jefferson, to speed the processing and training of Ohio's military forces. At these camps, military authorities also reorganized these individual companies into larger military units. While the state militia system had deteriorated throughout the first half of the nineteenth century, numerous communities had maintained units. These units existed primarily to march in parades and to provide young men with something to do in their spare time. These militia units provided Ohioans with a basic force to provide Ohio with protection from a Confederate invasion. The soldiers at Camp Jefferson usually remained at the camp for only a short time. After receiving some training, military officials would send the men to war. Leeke, Richard. A Hundred Days to Richmond: Ohio's "Hundred Days" Men in the Civil War. Bloomington: Indiana University Press, 1999.